The Montgomery County TIF is different than the Miami county TIF because the Montgomery County TIF is not a non-school TIF. That means that a lot of the money that comes in to this TIF fund is money that comes from the millage that would normally go to the schools. 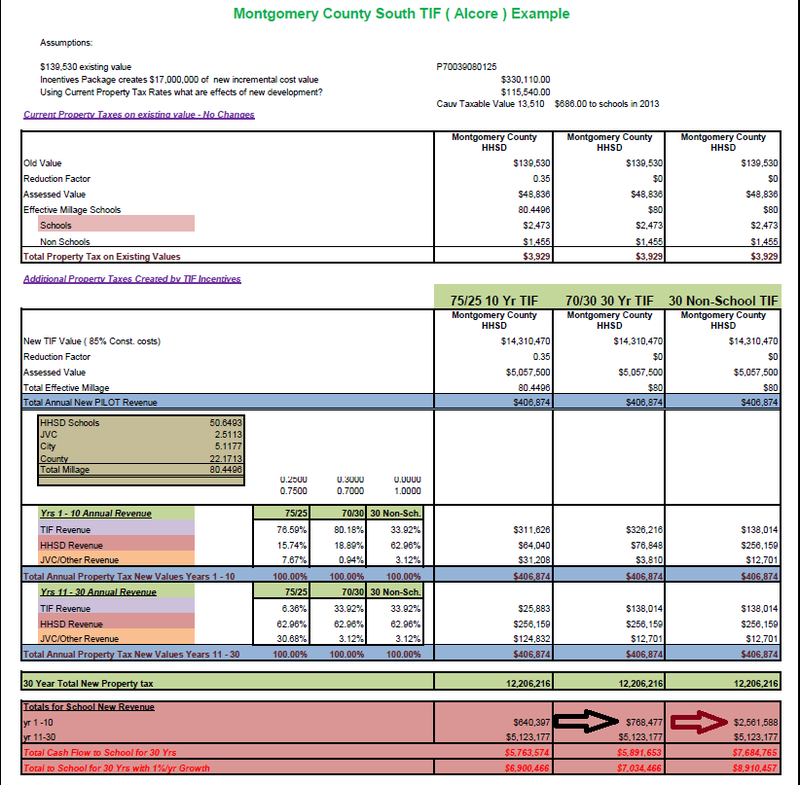 Now when the Montgomery County TIF was created this was actually a good thing. This TIF was a very responsible TIF. The I-70 TIF, the Montgomery County TIF, was a good TIF because it started out so that we could create / improve the I-70 interchanges. Without the I-70 interchanges, you wouldn't have a business, like Meijer, develop in that area. In order to entice businesses, such as Walmart and Meijer, the city decided to create a TIF to be able to pay for that interchange. That is exactly what the TIF is designed to do. development within the TIF district in order to play off the loan. As it turns out there was a lot of development in the TIF district and in 2010 the city had already collected enough money to pay off the loan for the interchanges. And there was still more development going to go on. In fact, the city had already collected three million dollars and it was sitting in reserve waiting to pay off that debt. The total project was only three million dollars so any money collected after that would be extra money and not needed to pay off the interchanges. State law says if you get to the place where you pay off the original purpose for the loan and you don't have another need for the TIF revenues then you have to dis-banned the TIF district. So the City had to find another infrastructure project to spend that money on. What the city did was decided to build the Aquatic Center. After an audit that predicted how much money the city could get over the whole 30 years of the TIF, the city decided we could do the Music Center too. So the original TIF district that was set up to get the money for the I-70 interchanges, is a district that's definitely going to pay off the Aquatic Center and then most of the Music Center. But what the issue turns out to be is the development wasn't happening quite fast enough in order for council to be confident we had enough funds to the pay off the music center. So council decided they would create a TIF anywhere in the city that was going to be developed. They planned to take the money that was going to come from the development and funnel it to a TIF fund. Now legally the law has a loophole in it that makes it so that they can do this at any time. TIFs are created by an ordinance that council votes on. Just like everything else, it is much more complicated than just that. When the Lane Park TIF was created in 2012, Council had the option of creating a TIF that took 75% of the levy money destined for the schools without the school's permission. The way the law was written at the time, if the city could get the school on board then not only could the school money be included in the TIF but they could also collect county money. So the school was approach with the option that either the city will take 75% of the school levy money or if the school board signs off on it than the city will only take 70%. Since the school has no choice in the 75% method it makes sense for them to get at least a little more. So when the Lane Park TIF was created by ordinance it tells you that Council created that TIF with the permission of the School Board. The City also had the option of creating the TIF as a Non-School TIF, meaning the city does not take any of the money from levies meant for the schools. I think this is the choice they should have made. This is a values issue. TIF's are in the law in order to encourage development. In the Lane Park development, the developers had identified that piece of property and had a tentative contract for that piece of property and a plan to build that whole facility before they even came and talked to the to the city. That development was on track to pay the schools $256,000 a year. If a city does not get involved the school gets it all. That money goes to the school. Instead the city comes in and because of the loophole creates a TIF and takes away about a $180,000 a year the schools would have gotten. They did this because they were concerned that the TIF district that was supposed to pay off the Music Center wasn't going to develop fast enough. So basically, they reached in there and they grabbed $180,000 of money that would have gone to the Huber Heights City Schools. Remember the city provided no infrastructure improvements at all to enticed that business to come to the city. That's where I have a moral objection to how this TIF was created. If a development is going to come in and the city does not need to pay for infrastructure improvements I think that the school should get the money that they would normally get because of that development. The other development that was a similar situation is the Family Dollar TIF that is now the Dollar Tree in the Huber Center. The city provided no infrastructure to get that development but they reached in there and grabbed 70% of the school's money. I have been advocating since its creation to make this a non-school TIF. I'm still hoping that in this last couple months we will see the council get on board and make those two TIF's into non-school TIFs. The reason that I want this to happen is I am very concerned that once I leave office City Council will go back to that philosophy where they will just grab 70% of the school's money every time there's a development within the city. They had that plan and they were implementing that plan before I became Mayor. I want to make sure that the current council and all the candidates that may get on council, understand that to TIF every development in order to take 70% of the money that normally would go to the schools is detrimental to the City and to the Schools. We need strong schools in order to attract the kind of people to the city that will help keep the city strong. I'm Mayor Tom McMasters. I appreciate the time that you took to read this and I hope you will contact your council members and candidates and ask them to show their understanding of TIF districts by supporting my effort to return this money back to the Huber Heights City Schools. The picture below is page 14 from the "TIF Examples and Estimates" from the updated 2025 plan. Look for the arrows and you can see the difference in the amount of revenue going to the school district during the first 10 years of the TIF for the current 70/30 TIF and a Non-School TIF which I propose we adopt. .
You can get a better understanding of some of the nuances of TIFs by comparing some common misrepresentations about Huber Heights TIFs Mr. Gore ended up propagating.